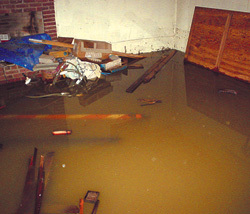 A sump pump system will protect your basement most of the time. However, mechanical failures in the sump or the sump pump switch lead to significant basement water problems. When waters are rising and rains are at their worst, you'll be glad there's a battery backup sump pump available to kick in and handle the water the primary sump pump couldn't handle. If you're looking for a great sump pump battery backup, Superior Basement Systems offers free, no-obligation inspections and quotes on the installation. Call or e-mail us today! Generator-powered sump pump backup in OH: For around $400, it's possible to buy a portable generator that can be used to run the sump pump if there's ever a power outage. However, this generator will only be useful if the homeowner is home and awake to turn it on, and usually must be started outside (in the rain). For $7,000-$10,000, you can choose to instead buy a powerful generator system that's wired to the sump pump and will turn itself on automatically. If you want your basement dry all the time and don't know if you'll be home - and awake - every time you lose power, the more expensive option is all generator-powered systems have to offer. Remember also that you'll be powering your primary sump pump and that no battery backup will be available. If the sump pump simply clogs or experiences a mechanical failure, there will be no other pump available to help keep the basement dry. 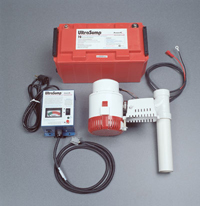 Sump Pump Battery Backup Systems: Top-quality battery backup sump pump systems in Ohio have been created specifically to last in crawl space or basement. These battery backup sump pumps can pump out 3-5 times more water on a single charge than an alternate power source is able to. The UltraSump® Battery Backup Sump Pump offered by Superior Basement Systems can pump more than 11,500 gallons of water on a single charge. If you want more power in your sump pump system, it's also possible to hook up two or more batteries to a single battery backup sump pump. Both. While a battery backup sump pump is the more important of the two because it can run even when the power goes out your basement will stay dry. However, prolonged rains or flooding are liable to use up the charge on any basement waterproofing system, eventually leading to a flood in the basement. However, using an AC-powered sump pump backup will ensure that your system has a second line of defense, and that as long as your home has power, your sump pumps will be working to protect your home investment. As a side note, be sure that if you're installing two sump pumps into a single location, it's important to use two sump pump discharge pipes to send the water out of the home. The pipes hold a limited amount of water, and the second pump will need a new venue to send it out. Superior Basement Systems would like to help you with your battery backup sump pump needs. For a free, in-home inspection and sump pump quote in Alliance, Ashland, Cadiz, Dover, East Liverpool, Hartville, Massillon, Millersburg, New Philadelphia, Salineville, Wooster, Yorkville and all across Ohio, call or e-mail us online today!